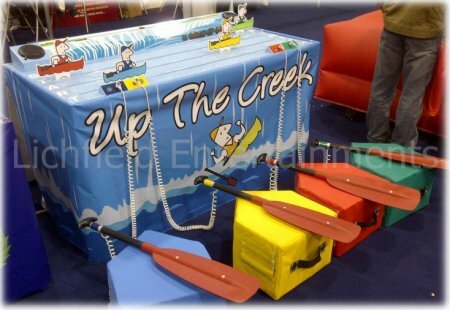 If you're looking to hire an interactive and energetic rowing game for entertainment at your event then our 'Up the Creek' is the perfect solution. The players sit on the coloured foam 'boat' bases and on the whistle start paddling with the oars as fast as they can. The faster they paddle the faster their colour co-ordinated boat will move along the race course. The first paddler to reach the end wins. The game can be played with two to four players and is recommend for ages 8 to adult. It requires an operating area of 12x12ft and is supplied with a member of staff to supervise its use. This activity is ideal for corporate fun days and evenings, sports clubs, etc. Its great fun to both participate and watch and is a game that gets the spectators cheering on the paddlers. If you have any queries, questions, or would like to make a booking for the hire of our boat racing game please call or click the button below to enquire and we will do all we can to help.